I'm SSJ4 Furanki previously known as Furanki Pkmn Master, SSJ4 Cartman, Cartman, and SSJ4 Furatman you might know me as that guy who used to crap out a bunch of South Park hacks, that never got finished and I used to think I was so awesome because of it. But, looking back at that I'm ashamed to have ever made those hacks. I'm surprised most of those were even allowed at places. 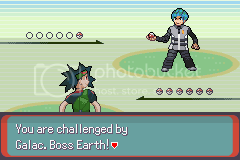 Anyways, this is a hack where, I'm trying to make it seem more like an actual Pokémon game. 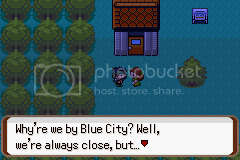 Taking things from GB, GBC, GBA, and DS Pokémon games and adding my own personal touch to it. I'm actually going to try to finish this one, in my spare time. Except in the Summer, and breaks, where I have a lot of time to work on this. 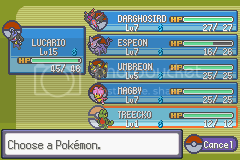 I originally started this hack on FireRed, but decided to switch to Emerald. 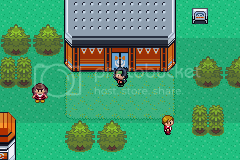 4 years later from (GRBY/RSE/FRLG) and 1 from (GSC/DPP/HGSS), you start out as a trainer in Red Town, in the region of Ohsai. You get to choose your first Pokémon from Prof. Bark, take on your rival, get all the badges, etc. You also have to stop Team Death. 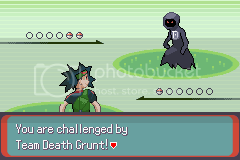 Team Death is pretty much a cult, trying to awaken Darkrai to put everyone in the World to sleep, and steal everyone's Pokémon and they're not afraid to kill someone in the process, they also want to use Spiritomb to scare people that are afraid of Ghosts, same with Gastly, etc. They're very Dark and Ghost type based, but they have a Pokémon they're going after far more destructive than Darkrai or Spiritomb. It's the very epitome of evil, could be considered an evil parallel to Arceus. - New Gym Types: This game will be using type that aren't used all that often or earlier than usual. - New Pokémon: Some Fakémon, Some 4th and 5th Generation Pokémon. 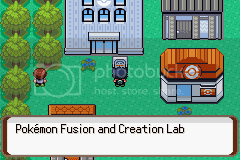 - Elite 4/Pokémon League is being replaced by a 10 or 11 floor building for battling in Ohsai. 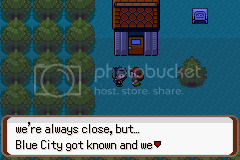 - You don't have to get the Pokédex, you can continue on with the game, however I recommend you still get it. - Brand New form for Deoxys. - Giratina only has its Origin Forme in this game. 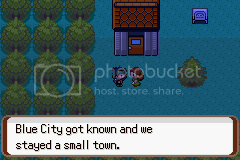 - Go to 2 full regions: Ohsai and Johto, also parts of Hoenn. - New TM's: Some will be changed. - Some New Items: A few have been changed. - The Mach Bike is now a "Hover Scooter", the Acro Bike is now a "Jetpack" I'm bringing in some science fiction. 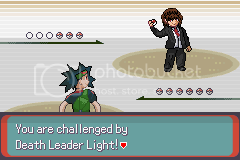 - New Rival(s): Your main rival's female, other is male. - Mild cussing: There's a lot of damns, etc. from regular trainers, but actual swearing like the "F-word" or "S-word" will only be said rarely. - All 1st, 2nd, 3rd Gen and other Legendaries catchable, plus whichever, Fakémon and 4th Generation legendaries I throw in. - Cameos of characters from Death Note. - Cameos of Pokémon characters, possibly from the Manga, but most game characters will make an appearance. 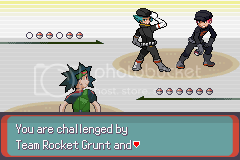 - Return of Team Rocket, Magma, Aqua, Galactic and possibly the new team from the 5th Generation games. Team Death and Galactic's confrontations may prove interesting. - Some existing may get type additions or changes. 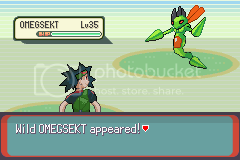 For example, it always seemed weird to me that Sceptile never got a second type. When, both Swampert and Blaziken did. Sceptile will now be Grass/Dragon, Charizard will become Dragon instead of Flying, etc. - A mix of Custom, HG/SS, and FR/LG tiles will be used. So, for example trees from all 3 will be used. 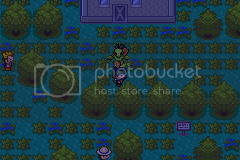 - All 3 of Ohsai's starter Pokémon can be caught later in the game. So, unlike the official games, it's just a matter of... which one do I want first? 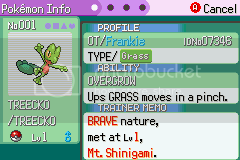 I can still catch the other 2 and more of my starter later. - Due to HG/SS giving "Gold" a real name "Ethan", I'm giving Silver a real name, he's going to be called "Damion" in this, since that means "to kill", which in my opinion fits with "Silver's" personality. - Everything I can possibly de-ALL CAPITALIZE, I will. Not the actual titlescreen yet, but this is what I plan on it looking like. Will eventually get down to listing them. Coolboyman: After playing Brown 2009, it gave me the will to try hacking again. 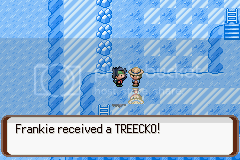 Nintendo and Game Freak: For releasing and making the game this is being edited from (Emerald). All the tool makers that made the tools that can make this possible. zealot: Better Name suggestion for the main Legendary. Green Charizard/PHO: Some of the DP Tiles. Japanese: None, as of yet. Spanish: None, as of yet. Italian: None, as of yet. French: None, as of yet. Looking good, I have a little constructive criticism on the graphics, but overall nice. - Some of the pallets look like they could use a bit of tweaking. Some of the outlines could go to be darker, and the black ones could do with being more of a grey colour. -Not sure how I feel about the 3 tile wide houses. None of the official games have done them that width, so it feels like it doesn't blend in well. Expanding them to 4 or 5 tiles wide doesn't look like it would be difficult, and could add to the "official" feel you said you were going for. Again, overall, looks like a nice start on what will be a nice hack. Keep at it! Yeah, I changed the screenshots since they weren't accurate anymore. Thank you. Yeah, with palletes I'm just still just testing them out. Some are Gen 4 based, others are just of my own choice. I completely forgot about the 4-5 tile rule. 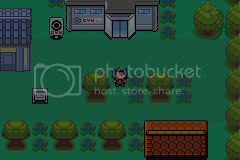 Yeah, I'm currently going right back through up to the 4th gym so I can release a beta, so I change all of those tiles that are like that. Thanks for pointing that out, I would've never caught that. just the title screen didnt match the game. 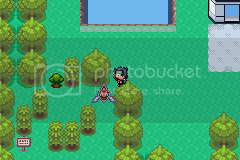 Looking real good, storyline's cool, and the some of the fakemon look Diamond and Pearl style, if you know what I mean. Yeah, well, the title still isn't even in the game. I's more of just a mock-up screen. Well that good, yeah, some of the Fakémon were influenced by DP Pokémon. I should finish this. I don't plan on stopping and I'll take hiatus' when I'm stressed with this. I have already, but I'm not going to full on stop. Wow, this seems pretty good, even though I normally don't like GBA hacks. I've definitely give it a playthough when you release a beta, keep it up man. Wow, thank you. That means a lot. Even though you don't seem to be working on it anymore, I loved your idea of the RSE devamp. This seems to be good! Yeah, once I get to the point of releasing a beta. I will send it on over for translating.